I live in the City of London so it is an easy walk past St Pauls across the Millenium Bridge, now no longer wobbling, to the Tate Modern gallery in the former Bankside power station.... just right for a stroll on a crisp sunny Sunday. I'm glad I took a camera yesterday because I came on some memorable glimpses of new civic space. 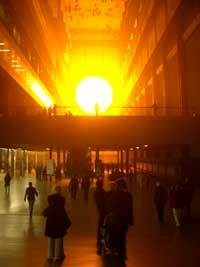 In Tate Modern the enormous former turbine hall is filled with misty orange light from an artificial sun. At the far end the floor is covered with people lying on their backs waving their arms and legs while watching the ceiling. Their movements are reflected in an enormous mirror, which also produces the top half of the sun, created by a semi-circle of neon lights. More here about Olafur Eliasson's installation - or watch click here for the short movie I made. You'll need Quicktime. Walking back over the bridge I glanced down to see a performance artist pirouetting gracefully on a drum anchoring four petals that rose and fell during the performance. Each lasted about three minutes, the time of a tape track. It was bitterly cold, but the dancer's poise held, with the briefest smile for each contribution to her tin. For the movie click here. 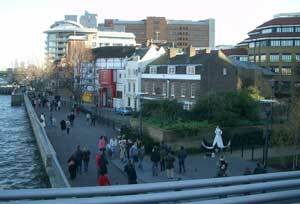 The Thames embankment was busy with tourists - and Londoners, I think - on their way between the reconstructed Globe Theatre, the Clink Museum and other elements of historic Bankside restored over the past few years. I see in today's Guardian architect Will Alsop arguing that the Bankside power station should have been pulled down in favour of a new building. He says that when he goes around it, he feels he's being guided as he might be around a shopping centre. 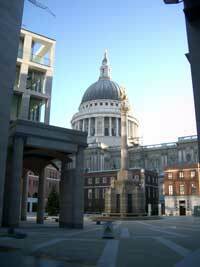 The mistake, he says, was to consult the artists themselves about whether they wanted a new building or not. Too conservative. Will favours creative approaches to client engagement including giving everyone a glass of wine and some crayons and encouraging a bit of messiness. He's currently persuading the good Yorkshire folk in Barnsley that their formerly mining-based community could become a 21st century Tuscan hill village, which is impressive whatever the outcome. I shouldn't think that Will likes the new Paternoster development north of St Pauls, but it is certainly a big improvement on the offices there before. Few of the shops are open yet, but a Christmas tree is being decorated, the pavements scrubbed, and it looks as if we'll have another public space in the City that is actually usable instead of a wild-swept piazza. What's all this got to do with the notional subject of this blog, designing for civil society? Something, I think, to do with the many different forms that design and engagement take. Sometimes one person's big vision, created without much consultation.... yet enabling people to become involved in the experience. Sometimes, like the performance artist, a challenge that you too could stand up and stop people for a moment's thought. Sometimes with the best-conceived designs - like the wobbly Millenium bridge - people are engaged because something goes wrong. Fortunately not dangerously so in that case. I had some better answers over wine and dinner last night, but forgot to write them down. If they come back, I'll add them here. Or feel free to do so yourself. Thanks to Daniel J. Wilcox for tweaking the movies, taken on a tiny Pentax Optio 'still' digital camera. How much better/smaller can this stuff get? Interesting that you describe it as 'civic space' David. My instinct (having only been to Tate Modern a few times, and not seen this installation) would have been to describe it as 'public space'. On reflection I think you're probably right, and the two aren't mutually exclusive; but to what degree do you have any sense of ownership or responsibility for that space, I wonder? It feels more like somewhere you have extended permission to experience something, rather than a place that embodies your rights as a citizen.